If we still had Blog Banters going this is one I would throw out as a topic because it is an exercise in estimation given incomplete data. This is a question that came up in an email exchange with Bhagpuss. I do, on occasion, communicate with people via sources other than the main page of this blog. I dropped him a note about something I heard on fleet coms a while back. A player opined rather firmly that EverQuest currently has more players than EVE Online. I have reason to believe that the player in question is/was in possession of information that indicated this, that it wasn’t just BS on coms but somebody with enough connections in the industry to know. I shared this with Bhagpuss because we both enjoy these sorts of informational tidbits, but I wasn’t sure it was worth a blog post. And it probably isn’t. If it was I would be done writing by this point. Instead Bhagpuss asked the pertinent question, which is the headline for this post. Neither of us has any insight or information as to how many people play EverQuest these days. The game is coming up on 20 years in age and in many ways feels its age. But a lot of people played EverQuest back in the day. It was the gateway drug into MMOs for a lot of people and it retains a lot of nostalgia value. However, Daybreak is a private company so we don’t get any financial numbers, much less subscriber or player numbers. Even when it was part of Sony its numbers were buried so deep in the financials of its various parent organizations as to be invisible. All we really know are some estimates based on press releases and various guesses and whispered information. There is that old chart. Click on it to make it bigger/legible. It shows EverQuest peaking at 550K subscribers and then dropping down, with the last number being 100K at some point during 2010. After that the estimates stop. 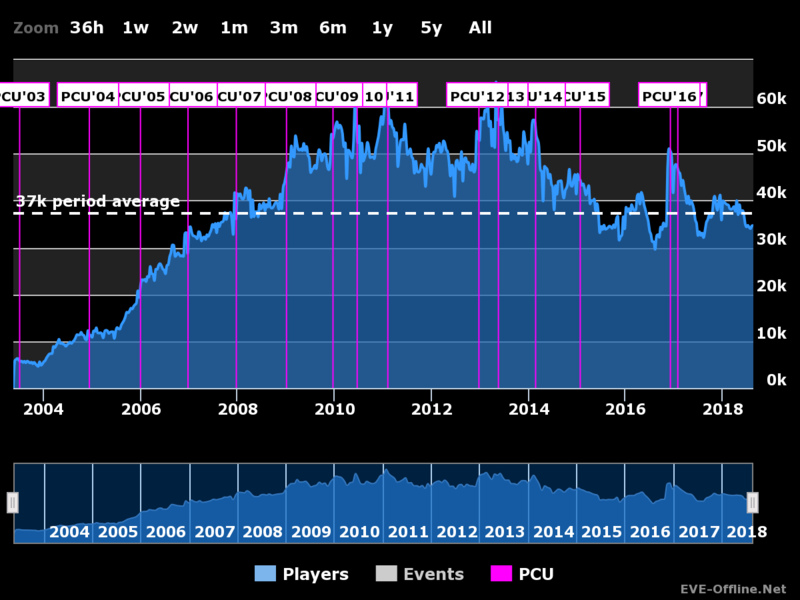 EVE Online is also on that chart and it peaks at 500K worldwide some time at the end of 2012, which coincides with the peak concurrency event for the Serenity server in China. The Serenity server’s brief moment of popularity fell away rather quickly if you go and look at the numbers at EVE Offline. The numbers for Tranquility, which hosts the rest of the world, peaked around 350K at about a year before, after which there is no further data. I suspect that CCP switch to world wide data during the Serenity surge because that sounded better. There is also the theory that some put about that the player numbers for DUST 514 were being folded into the overall EVE Online numbers because we were able to drop rocks on them from space and possibly see them in our in game chat. The only issue there is that I don’t think that DUST 514 numbers were enough to influence the total that much. Anyway, by the time we get to 2014 we are out of even estimates as both companies had clammed up. There are no press releases for dropping customers, only for hitting new peaks. And since the end of the data points for both EverQuest and EVE Online both have gone free to play in their own way. For EverQuest went free to play back in 2012 for its 13 birthday. Some bar mitzvah present. At that point the live servers were free but you needed to buy at least the latest expansion if you want to play the new stuff and if you wanted to play on one of the nostalgia servers you had to subscribe. This was a somewhat traditional free to play, with the nostalgia server bonus for Daybreak. For EVE Online the free plan meant the introduction of Alpha clones with the Ascension expansion back in November 2016. Alpha clones were free, but could only use a limited skill set and the client blocked you from multi-boxing Alpha clones. They couldn’t cloak, run a cyno, or fly anything beyond a cruiser of their racial choice initially. That loosened up with the Arms Race expansion last December, but you still can’t log in more than one unless you’re tricky. Industry wide there has been the claim that going free increases the player base of an MMORPG, but we have to stop talking about subscribers and just talk about players, since not everybody who is playing is necessarily paying. For EverQuest that is all interesting, but doesn’t help us much. For EVE Online though we have the data points referenced above at EVE Offline. The question is, how does concurrency map, if at all, to the player base. We know that the player base is greater than the concurrent users online because not everybody is logged in together, and all the more so for a server that hosts a world-wide player base. So the simple answer seems to be to find the ratio of concurrent users to known player base numbers from the past to see what estimates that gives us now. Looking at the late numbers for Tranquility in 2012, we have 350,000 users. It is a little more, but I will take the round number for ease of use. 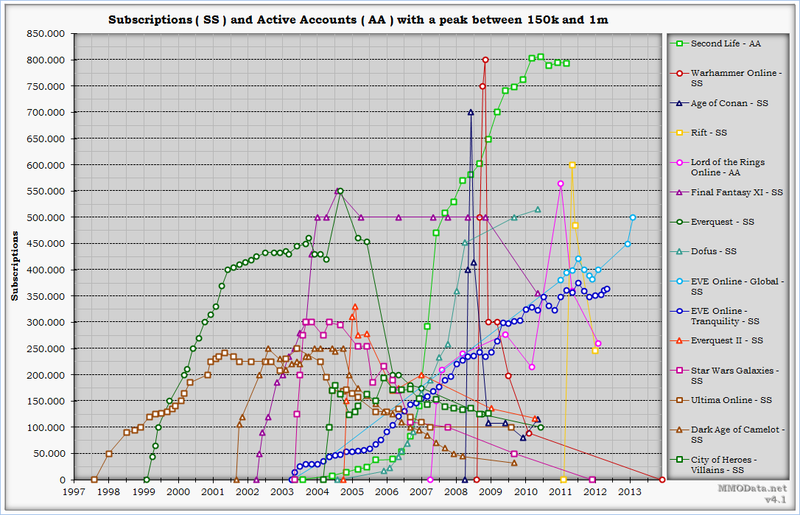 The average concurrent users number for 2012 was 43,000. That gives us a ratio of 8.14 to 1. One concurrent user equals about eight total users. If we use that number and multiply it by the average concurrent users for the last 12 months, which is 33,000, we get an estimated player base of 268,604. That number seems problematic to me. I guess you could convince me that EVE Online has that many players, absent other data. But if we are buying into the statement that EverQuest has more players, then that is where I stumble. It might be just me, but I have trouble with the idea that the EverQuest population jumped so much with free to play that it is 2.5x its last subscriber entry six years later. Is there that much nostalgia for Norrath? Maybe 2012 isn’t the right year to go to for the ratio. Let’s back off to 2010. The subscriber number on the chart is 300,000 for that while the average concurrent users number is 47,000. That gives us a ratio of 6.38 to 1 and a possible user base of 210,638 players. That gets us closer to reasonable, but it still seems like a big number for EverQuest, beloved though it might be. If we go back another year to 2009 the subscriber number seems to be about 225,000 and the concurrency number 44,000. That gives us a 5.11 to 1 ratio and a possible player base of 168,750. Now I have three numbers with a range of 100,000 players and my like or dislike of them is based solely on my gut feeling for how many players EverQuest might have these days. The lower the number gets the more comfortable I am with it for EQ, but the smaller the ratio gets the less likely it seems to be accurate. Again, that is my gut speaking, but 20% of the EVE Online player base being logged in at any given time seems like a lot. And I can keep moving around the years and getting different numbers. 2008 gives a ratio of about 5.71 to 1, so more, while 2007 sums out to an even 5 to 1, making for less. The subscriber base is between 150,000 and 225,000 for those two years, while the average concurrency is 30,000 and 35,000. The average concurrency for the last twelve months sits between those two numbers, so perhaps the current number is also between 150,000 and 225,000. But with free to play the ratio ought to be higher, there ought to be more casual players on as Alpha clones. After all, we have been told time and again that a free option increases the player base. Then, however, I get back to the “must be less than EverQuest” parameter which seems less likely to me the more the current player base estimate grows. So I don’t really know. The initial assumption could be wrong. Those old subscriber number charts could be wrong. And what constitutes a “player” in any case? There is always the differentiation between subscribers, players, and active accounts. Few games reward players for running multiple accounts the way EVE Online does, so the ratio of players between EQ and EVE might be different enough from the ratio of active accounts as to be significant. In the end, all of this is just food for thought as I don’t think anybody is going to give us any real numbers, but I’d be interested if anybody could come up with another way to try an get an estimate on numbers. GamesBeat: Is the game still well into the hundreds of thousands of players? Petursson: Yes. The MAU fluctuates a bit, but it’s 200,000 to 300,000 people. Well, a range of numbers that is still 100K wide, but the base is 200K. MAU is still a BS metric the way some companies (like Blizzard) use it, but in this case it gives us something to stand on. It doesn’t distinguish subscribed from free to play or count those playing the long game on training, but it is a number. This entry was posted in entertainment, EVE Online, EverQuest and tagged Crazy Talk, No Answers, Player Base on August 27, 2018 by Wilhelm Arcturus. It’s a lot of apples to oranges, since there’s no metric activity that would be considered “stable” after 5+ years in an MMO. Even something like the # of ISK transactions wouldnt be a fair assessment as the need/use of ISK shifts over time. K/D or war cost ratios are also a poor metric since the changes to EvE zone control structure have forced something to happen that otherwise would not. I seem to remember reading somewhere a long time ago that the ratio of concurrent vs. total players in an MMO is about 1:10. Unfortunately I have no idea anymore where I read that. It does sound a tad high when comparing it to your numbers here. And I can easily believe EQ having 200-300k players, since presumably only a small fraction of those will be actual subscribers. I remember that study that said that only 2.2% of players of free-to-play games actually spend any money. I think that might have been focused on mobile games and in an MMO I would expect the ratio to be slightly higher, but even if we assume 5-10%, that would still leave EQ with only 30k subs or so, and that seems very doable. Very interesting line of thought in any case! That’s a very comprehensive answer to my off-the-cuff question! Yes, I find this sort of thing quite fascinating so I’m always interested when you tell me about these supposed facts and possible rumors that various people let slip. Partly it’s self-interest – I want the MMOs I enjoy playing to have at least a sufficient population to keep the lights on and the servers up but mostly it’s sheer nosiness. When we both started playing EverQuest they used to show the actual number of people playing on the server select screen. That had certainly stopped before EQ2 arrived. Sadly, I don’t have any screenshots from that period and I can’t really remember what the numbers were. However, someone on the EQ2 forums said in 2008 that he remembered “in EQ 1 when they would actually tell you at any given time. Anything over 3300 as considered as an overload” and that does sound very familiar to me. I believe I recall the number 3000 being bandied about a lot when people were demanding their server be split, as happened all the time in the days before WoW. By 2015 an EQ server apparently could hold around 4000 players if marked “Full”. I get this from a forum thread: https://forums.daybreakgames.com/eq/index.php?threads/how-many-people-can-a-server-hold.221412/ in which Absor, the then community rep, is quoted as giving this figure to someone in game, so it’s hearsay evidence at best. Presumably the march of technology means modern servers hold more than they used to but it’s a long time since I saw any EQ servers flagged “Full” except at the launch of a new TLE. EQ currently has 22 servers (excluding Test and Beta) and as I write this, on a Monday evening at half past eight UK time, so mid-afternoon East Coast, before lunch West Coast on a workday, two of those are flagged “High”, six “Medium” and the rest “Low”. That surprises the heck out of me. I’d be very interested to hear reports of how those servers are rated at peak US time midweek and again at peak time at the weekend. If we assume Full is 4k, High 3k, Medium 2k and Low 1k or less, and we use the ballpark figure of three accounts offline for every account online (which I believe is what SOE used to quote), we’d be able to get some kind of ballpark figure. I definitely think you’d need to use the data from US Prime time but even using the figures above you get to somewhere around 90-100k accounts. I would definitely be willing to believe EQ still has 100k players. When I play the servers I play on feel busy and as I say I play only on off hours on US servers. A hundred thousand people would be enough to keep the game going profitably I would think. If your informant is correct, however, EVE would have to have less than that and from your figures above that seems unlikely. Basically, if the original data point is correct (EQ has more players than EVE) then either EQ is doing a LOT better than we think it is or EVE is doing a LOT worse. Either way it’s pretty intriguing. We might, of course, simply dismiss the whole statement but what would be the fun in that? Not knowing Eve or EQ really all that well. But that monthly economic report that you link monthly seems like it could be parlayed into user growth at least approximately if you normalize it properly. Especially if it goes back a number of years to account for things like seasonal shift in people’s activities. I can offer one insight from outside the industry that might hold true within it. With churches the average number of active worshipers (concurrent players) to total members (total players) is 1:3 on average. But that number moves based on how well the congregation is doing and how passionate the membership is. The end result is a sort of upside down bell curve. Really struggling congregations have percentages nearly as high as really healthy fast growing ones (as high as 1:2 is not unusual), because both sets of people are dedicated to the community, though in different ways. “Average” congregations actually have the worst ratios. Those numbers don’t mean anything in an absolute sense, but in a relative sense the lesson is the concurrent number of users could be highest both for newly released games with that fresh server smell AND with older nostalgic games with nothing but old hands keeping the place running. In this case that means the concurrent user ratio may be even better than 1:5 ratio you found in 2007. One other thing I’m curious about that muddies the waters: does this number from EVE Offline reflect concurrent players, or concurrent logins? Multiboxing is the standard in EVE Online, right? How many of those are 33k players are running two or three logins at the same time? @HZ – Multiboxing is most definitely a thing. If you have a capital ship and use it regularly then you pretty much have to have two accounts. So it is pretty common. People often multi-ship rat or mine, or have a ship with the fleet and another off scouting. And if there is a big capital ship fight like the one at X47 there are probably a lot more accounts than players in the mix. Then again, a lot of people just have one account or just run one account at a time to cover various tasks. Despite the outlier tales of people running 20 account Rorqual mining fleets you’d have to work to convince me that the concurrent accounts logged in were more than double the actual people behind them. Multiboxing is a huge thing in EQ. So much so that they had to make special rules about it for the TLE servers. And then make new servers that didn’t allow it at all. And those were Subscription only servers, too. It’s not at all unusual to see people running about in six-account groups and to do that either on TLE or in current content you have to be subbed. I’ve always felt EVE is unique in terms of total subs vs concurrent players because of EVE-Offline. I also feel that is even more a factor today than in years past, because of the longer skill queue and skill injectors/extractors. I’ve personally gone close to a year playing EVE-Offline across multiple accounts, and it never feels like a waste of money, especially because the $140 or so a year per account is peanuts. Combine the above with the suspicion that the average EVE player is older and likely has more disposable income, and I’d venture to guess the game has one of, if not the, highest (lowest?) ratio of subscribers to concurrent players. So perhaps EQ1 has more active players per day than EVE, but I see zero chance of EQ1 having more subscribers, or even being close. A very interesting topic, comparing two of the most complex MMOs to get into from the new player perspective. That may have an impact on any free to play effect on the playerbase – I imagine it’s less than normal because the games are that much more complex than anything else in the genre. The F2P move was good. There are more players online and potential omega accounts. The problem with eve is that people see the steep learning curve as an issue , rather than make it what it is, a casual gamer filter.